Are you wondering where the 2020 process stands and where it is headed? We can talk and type all day long, but sometimes a picture is worth a thousand words. We’re in the middle of a sustained effort to solicit your input, ideas and goals for the community’s vision. Many of those goal will require additional work and discussion – you’ll see an idea of what some of that work might be below. 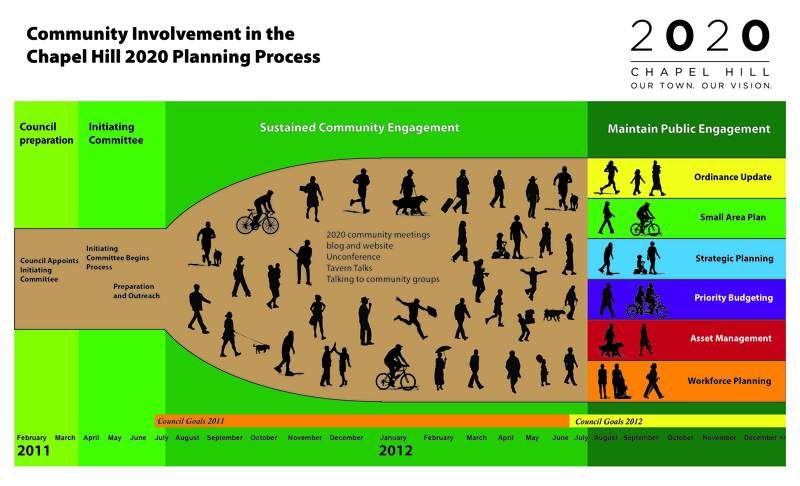 In some ways, the Comprehensive Plan is only the beginning, the roadmap of where the community wants to go. We are excited by the level of engagement and participation, with hundreds (and thousands!) of people having an impact on this effort. We hope you’ll continue to participate – there are a number of fun and interesting events coming up. Please check the meetings and materials page for details – the Tavern Talks begin this week, the visioning work session, Future Focus, happens next week – and there are presentations by the schools, the Chamber of Commerce and more. I do not think we can extend the length of this process. Again, the town denied commercial development (Charterwood) on a transit corridor. This is supposed to be where we want commercial development. While projects keep getting denied, property taxes continue to go up. This continues to make Chapel Hill a resort like bedroom community by default. Right click on the image and choose “view image”. Then go to your browser toolbar and, under view, choose “zoom in”. Under view/zoom, you might have to uncheck “zoom text only” if that is already checked. This, of course, is on a PC. If you have a Mac you’re on your own unless someone else can chime in.